One of my favorite things about summer is eating the fresh produce from my vegetable garden. Nothing can beat the flavor of tomatoes, corn, beans, squash and peppers that have just been picked. These fresh vegetables are a well-deserved reward for the time and effort it takes for the gardener to grow them. A critical factor in the success of any garden is creating an efficient garden layout. 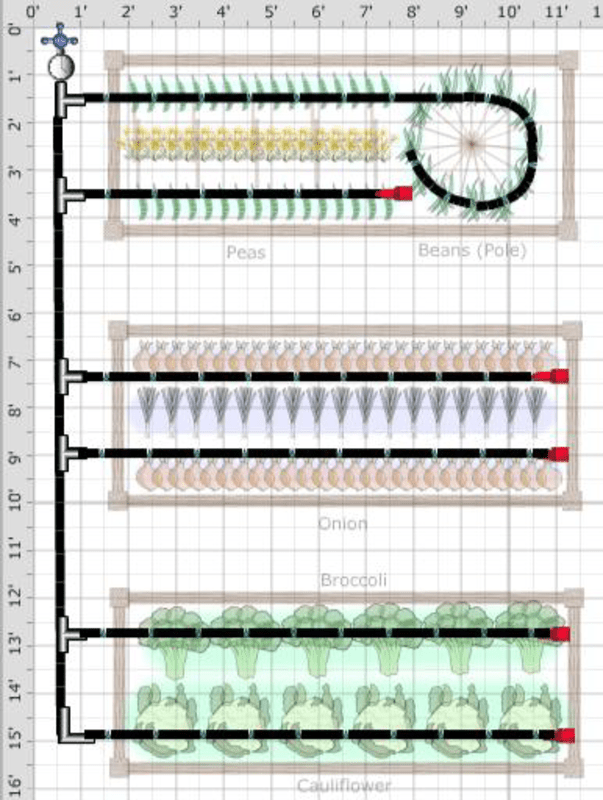 Being an engineer, for my early vegetable gardens, I was able to use CAD software to create my layout. This was satisfactory and certainly provided more accuracy than was needed. It was also much better than doing it by hand like many people do using graph paper and repeatedly having to erase and redraw everything. But I had to do a lot of extra research to figure out plant and row spacing, when and how to plant, and other information, for all my vegetables. So last year I decided to make the leap into software specifically designed for creating a vegetable garden layout. I spent a considerable amount of time evaluating numerous gardening applications before deciding on the Garden Planner by GrowVeg.com. I have used the application for two garden layouts and have been very pleased with its usability, flexibility and power. I am far from a "Super User" on the Garden Planner, I probably use about three quarters of its extensive capabilities, but it's nice to know that those features are present if I decide to take advantage of them sometime in the future. Since my experience with the vegetable Garden Planner has been such a positive one I felt it was worth my time to share what I've learned about the application by writing this Garden Planner review. My hope is it will encourage others doing vegetable gardening to try this valuable tool to create the layout for their vegetable garden. You can watch the video below from GrowVeg.com in order to get an excellent overview of the capabilities of their Garden Planner. Then continue to read on to get more detailed information. The basic capabilities for creating the vegetable garden layout will be presented first followed by a list of additional features that allow you to do so much more using this application. Finally, some additional factors to consider as well as my recommendation will complete this review. The first step in any vegetable garden layout is to create a drawing that includes both planned and existing garden objects. This could be a simple is a single rectangular raised bed or a large and complex garden including a wide variety of different types of objects. For example, it might include a large garden plot, raised beds, planters, sidewalks, containers, and a greenhouse. Before creating a plan in the Garden Planner it's necessary to measure the entire garden area which may contain multiple growing areas or vegetable beds. The size and location of beds and planting areas and the gaps between them must be recorded along with the size and location of any stationary objects such as ponds, walks and greenhouses. The plan is drawn in the Garden Planner by using shapes that are easily added to the plan by first selecting them on the toolbar and then moving the mouse to the location on the plan where you would like to place the shape. Then click and hold down the mouse as you drag out the shape to the size you would like. Once the shape is on the plan the size can be changed by using the handles or by specifying the exact dimensions. Shapes can also be copied, pasted, rotated, and moved on the plan. Shapes can be easily added to the plan using one of two methods. There is a wide-ranging and flexible collection of drawing tools which will allow you to create a drawing of your garden area to scale. There are a variety of different lines and shapes, in different colors, and the ability to add text as well. The combination of these tools makes it possible to draw most garden areas. To make things even easier there are a large number of predefined objects typically used in a vegetable garden design. They include things such as: baskets, trellises, chicken coops, cold frames, compost bins, containers, fences, greenhouses, hoop houses, pathways, ponds, raised beds, sheds, planters, and water barrels. These can easily be added to your plan and sized appropriately. Once the garden has been accurately drawn it's time to begin to add plants to the garden. Plants are added from the selection bar which contains a picture of each plant. Also, associated with each plant is an information box which contains essential growing information such as the type of soil it requires and whether it prefers a sunny or shady location and much more to. Similar to the manner in which shapes are added to the plan (above), to place a plant on the plan it's necessary to first click once to pick it from the selection bar. Then move the plant to where you would like it located on the plan. Click again to place a single plant or hold down the mouse to drag out a row. The plants will automatically be spaced correctly in the row. By using a corner handle you can also drag the plants into a block. Once plants are added to the garden they can be copied, pasted and moved. The number of plants of each type on the plan. This helps in determining how many seeds or plants to purchase or how many seedlings to raise. This indicates the spacing between plants (for individual plants or blocks of plants) or rows of plants. 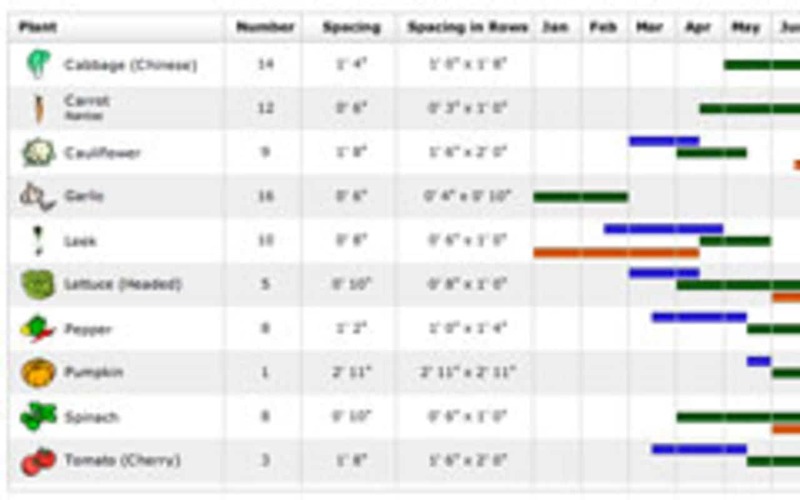 Using a bar chart with the months of the year running horizontally, colors are used to show the recommended time to sow seeds indoors or undercover, sow seeds/plants outdoors and to harvest the plant's fruit. If the overall vegetable garden area is relatively small (about 30 feet wide) it is possible to print your plan on one page. The program will scale it such that it fits. With larger plans you can specify how many pages high and wide you would like it spread out on or you can specify a custom scale as a percentage. Another great Garden Planner feature is the ability to publish the plan to the web as an image with any description and notes you wish to include. This makes it easy to share a garden layout by copying a link to the published page into blog posts, email messages, Facebook and Twitter. Publishing a plan to the web also enables gardeners to access it (along with any plant list and notes) on any mobile device with an Internet connection, making it easy to take a plan on the go. That is a summary of the Garden Planner's basic layout capabilities. The Garden Planner by GrowVeg.com is very intuitive so that the basic capabilities can be learned quickly and a vegetable garden layout produced. But believe it or not there are many more useful features available in the application for the gardener who wants to take their garden layout to the next level. In the next section I will cover some of these interesting and useful features that might make you a more effective gardener. The Garden Planner supports a number of planting methods. The simplest being the placement of individual plants. Plants can also be organized in rows (using plant row spacing) or in blocks (using plant individual spacing). And for gardeners with limited space, there is assistance in laying your garden out using the "Square Foot Gardening" method. This consists of dividing a raised bed into 1 foot x 1 foot squares and growing a different vegetable in each square in a quantity between 1 and 16, depending on the plant. In the Square Foot Gardening mode the Garden Planner enables you to easily arrange 1 foot squares of plants on your plan. The plant icons are automatically produced as squares, and a number in the top left corner of the icon tells you how many of that plant to grow in your 1 foot area based on the specific plant's needs. A useful feature of the Garden Planner is that it will adapt to your location. GrowVeg.com has a database of over 5,000 weather stations. When starting with the Garden Planner you can click on the "set frost dates" feature and locate your garden by entering in your zip code (or address if not in the US). The application will then use its database to automatically set your frost dates. If your location is not yet added into the database, you can select your location on the map and set the frost dates manually. When setting the frost dates, there is even a box to check that will allow you to split your growing season into two if your climate has several different growing seasons. This will separate spring and fall planting times and will show you planting and seeding dates. In addition you can tell whether those plants should be started in the ground or possibly in pots or a green house, as well as the harvest times for the vegetables or fruits you have planted. If you're like me you may have trouble remembering when to plant or sow seeds for each variety. This can especially be true if you are doing succession planting. The Garden Planner can help you with this by optionally sending you reminder emails every couple weeks to keep your planting on schedule. One type of succession planting is the practice of growing more than one plant in the same area at different times during the growing season. This allows you to achieve maximum harvest from a given area and is particularly useful for those with small gardens or long growing seasons. The Garden Planner will support this type of succession planting so that you can specify multiple plants in the same area. Then you can view your garden at different months of the growing season and see what plants will be in the ground at that point in time. Crop rotation is another concept that the vegetable gardener needs to be aware of. It is important not to plant varieties from the same family in the same area year after year. This can cause soil nutrition deficiency, pest buildup, and plant disease. Unfortunately, this is often difficult to track manually. Fortunately the Garden Planner can help you with this important task. It organizes all the plants into one of six crop families. The application will then look back to what has been planted in your garden during the last five years. When you're in the process of laying out your vegetable garden and you select a plant to add, areas of your plan will flash red to warn you of where you planted the plants in that family on last year's plan. This makes it easy to find the best place to plant without having to remember the crop family of each plant. The red warnings become dimmer when indicating overlap with plants from prior years. Of course these warnings can be ignored or switched off if desired. Although there are more than 140 vegetables, fruits, and herbs available in the Garden Planner, it's good to know that additional varieties of plants can be added and existing ones customized. Plant labels can be repositioned, renamed, or removed completely using the Plant Edit box. For each plant you can specify a specific variety by using a pulldown list, which contains a large number of common varieties, or create your own new variety. With the varieties you create you can customize the spacing between plants, and adjust the planting and harvest times. If you want to add a plant which is not currently in the Garden Planner's database you can first choose an icon that is close to the plant that you are adding or use one of the generic icons and add it to your plan. You can then set the specifications for this new plant in the manner discussed above. The Garden Planner is an online application which has numerous advantages. Since it uses a web browser as its interface there is nothing to download and install and keep updated. Also all of your data is securely stored on the GrowVeg.com servers and accessible from any browser. Perhaps the best decision I made in designing my garden area was the addition of drip irrigation. There are numerous advantages to drip irrigation when it comes to the health of your plants. But more important to me was the convenience of not having to water manually. By occasionally adjusting the settings of my irrigation controller it automatically dispenses the correct amount of water to the base of all of my plants. The Garden Planner can help you lay out your drip irrigation system by using its collection of standard drip irrigation parts. Once your design is complete the program will provide you with a parts list of everything you will need to implement your design. Similar to other drawing applications such as Photoshop, the Garden Planner has implemented the concept of layers. It has five layers including: Structures Layer, Plants Layer, Text Layer, Irrigation Layer, and Layout Layer. The Garden Planner knows which layer each object should reside on, so greenhouses will always be placed on the structures layer etc. By default, all layers are visible on a plan and you can edit shapes on any of them. For more detailed editing, use the layers drop-down menu to select a particular layer. This brings that layer to the top, dimming the other layers. Only the selected layer can be edited until you return to the All Layers selection. The more complex your design the more the capability of layers will facilitate the creation of your vegetable garden layout. If you need them GrowVeg.com offers several ways to help you as you create your garden layout. There is a thorough user guide, an extensive set of FAQs, and a number of video tutorials which will help you become proficient with the Garden Planner in no time. In addition to this, you can send an email to get in contact with the customer service agent. They will normally either email or call you back In one or two days. As you can see in addition to the basic capability of the Garden Planner it has a large number of other useful features that will make the task of planning your vegetable garden a pleasure. Although not direct features of the Garden Planner itself, there are other factors that you may want to consider as well. The GrowVeg.com website has a treasure trove of content that will help you on your gardening adventure. There are GrowGuides, which are essentially organic gardening articles and advice. In addition there is a GrowBlog which contains gardening articles written by their experts. The number of articles in these two areas is staggering and may just include the information you need for your specific gardening challenge. In addition, on their GrowVeg YouTube channel there are a large number of videos covering a wide variety of vegetable gardening topics. The Garden Planner has received an award from the National Home Gardening Club. In independent tests, 91% of the gardeners from the club approved GrowVeg.com. In the review of, Online Tools for Planning the Perfect Vegetable Garden on smallfootprintfamily.com they say, "The GrowVeg.com garden planning app is the Cadillac of online gardening planning software." In the review of the GrowVeg.com Garden Planner, Tee on the veggiegardener.com states, "Overall, I highly recommend using GrowVeg Online Gardening Planning Tool for all your gardening planning needs. The detailed plan, and the plant list, crop rotation and succession planting features make GrowVeg the garden planner to use." The best way to decide if the GrowVeg.com Garden Planner will work for you is to take it for a free 30-day test drive. All the features of the application are available so you can try all that are of interest to you. There is no need to provide any credit card information in order to take advantage of the Free 30 Day Trial. If you decide that the Garden Planner will work for you the cost is a modest $25 for an annual subscription. The two year subscription is $40. 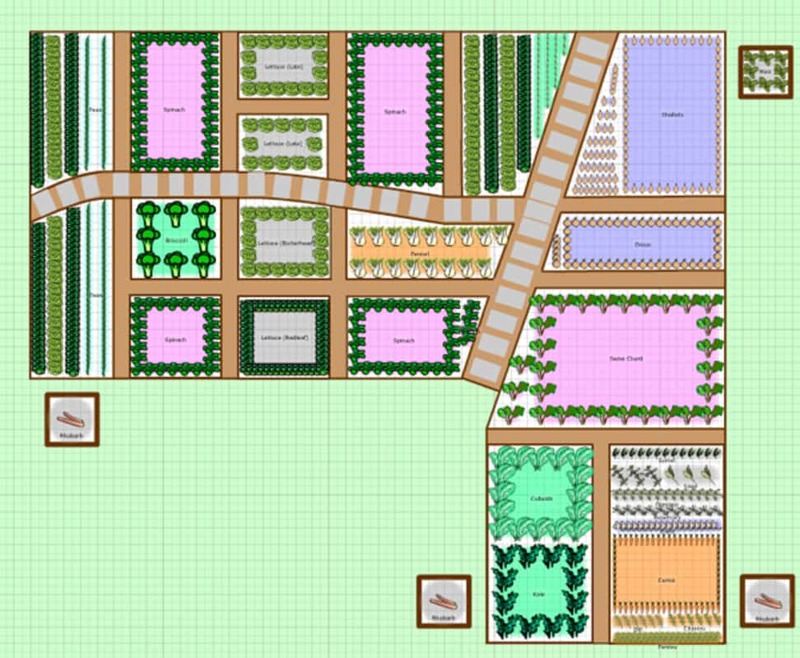 Based on my experience I strongly recommend the GrowVeg.com Garden Planner online garden layout tool. The first step in creating a successful garden is to develop a plan which takes into account issues such as plant and row spacing, crop rotation and succession planning. The Garden Planner will help you easily take all these factors into account. After a very minor learning curve you will be able to quickly come up with an effective vegetable garden layout that will maximize your harvest. And once your layout is complete the program generates a list of the plants you'll need to purchase and will also indicate when to plant and harvest them.